Montien Boonma carefully positioned himself internationally while drawing heavily on his own Thai culture. At the time he was graduating from art school in Bangkok, Thai artists were being torn between the options of state-sponsored neo-traditional painting and the neo-classical influence that had dominated the European academies in the previous decades. Boonma made a conscious effort to find a different path, one that participated fully in the global mainstream while benefiting from those things he held dearest in Thai culture. While he was a devout Buddhist, even spending time in a rigorously ascetic monastery, he was at pains not to be typecast as a Buddhist artist. 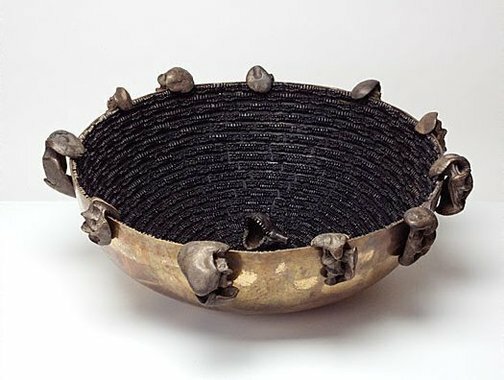 Many of Boonma’s works use imagery of the bowl. The monk’s bowl is held out empty to be filled by passers-by in an act of mutual exchange; by giving we receive blessings so an empty bowl in fact brims with positive potential. Boonma was deeply influenced by arte povera but most of all by Joseph Beuys and his belief in the power of art to heal. ‘Untitled: two acts II’ is a large, brass bowl with a number of knuckle-like forms clinging to the rim. 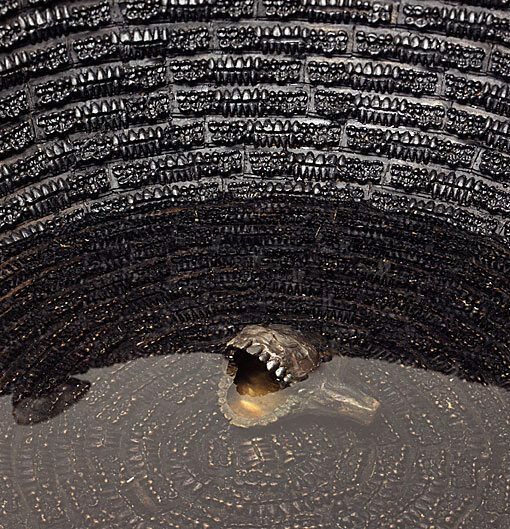 The inside of the bowl is completely lined by impressions of Boonma’s teeth and is partly filled with wine. At the bottom is a heavy scoop made from impressions of inside his mouth. The objects around the rim were made by squeezing lumps of clay until they took on the shape of the inside of his fist. These were then cast in brass. The shapes seem at first to be bone-like, possibly vertebrae, until the imprint of the hand is discerned. This intensely personal imprint of the artist is offered up as a ritual of sharing, where the viewer is invited to drink as if from the interior of the artist's own body. ‘Perfumed paintings and stools’ 1995-97 (AGNSW collection) is a diptych that at first sight might be taken for a pair of monochrome paintings. These paintings however are more object-like and are painted onto layers of papier-mâché. The surface is immensely crusted and shows deep, drying cracks almost like mud. In front of each painting is a small footstool covered in plasticine that reveals the footprint of the artist – an invitation to take off your shoes and stand in his place with your face a short distance from the surface of the painting. It is not necessary to literally stand in the artist’s footprint to become aware of a herbal aroma coming from the paintings. Boonma made a great many herbal works particularly in his later life. The herbs are intended as a healing experience and as another form of meditation: stand near and enjoy the combination of optical monochromes and the associated monoscents. Anthony Bond, Contemporary: Art Gallery of New South Wales Contemporary Collection , 'Imagining the body', pg.246-289, Sydney, 2006, 254, 255 (colour illus.). Art Gallery of New South Wales annual report 2003 [for the year ended 30 June 2003] , 'Year in review', pg.14-35, Sydney, 2003, 21. The Asian Collections Art Gallery of New South Wales , Sydney, 2003, 333 (colour illus.). The colour illus. below on page 333 is a detail of this work.